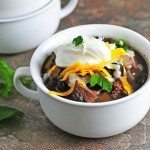 This Black Bean Chili Recipe is perfect for an easy weeknight supper. 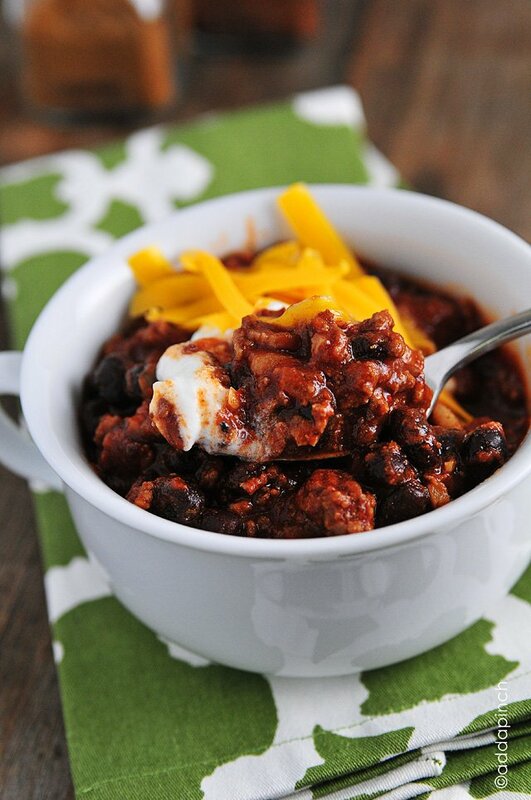 This best chili recipe is full of delicious ingredients and on table in 30 minutes! Chili. It’s what’s for supper. This Black Bean Chili is perfect for a weeknight supper. This is one of the best chili recipes and such a favorite because it’s so hearty – and so easy! And it doesn’t have to simmer all day long for it to be delicious! I don’t know about you, but that’s my kind of meal – especially when I’m in a rush during the week! 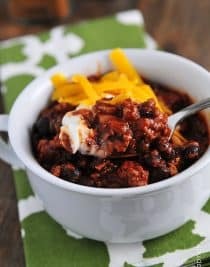 Don’t get me wrong, I love a slow cook chili that simmers and bubbles on the stove for the afternoon and slow cooker chili is absolutely a favorite. There are many days that our clock strikes 4 o’clock and I haven’t started anything for supper. These are the days that I love to pull out a recipe like this without missing a beat in flavor and taste. 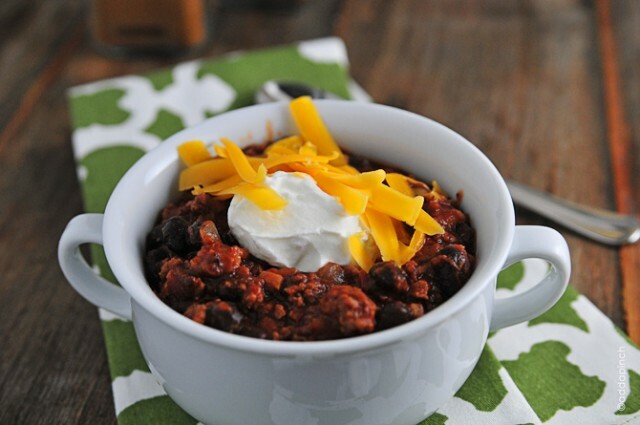 These are just the days for this easy chili recipe! It’s just a smart idea to have a good chili recipe like this one in your arsenal for such nights. Here’s how I make it. Add diced bacon to a heavy bottomed stock pot over medium heat. Cook until crispy, then add onions and garlic and cook until tender. Add ground beef to brown and cook until done. Drain off any excess drippings, put cooked ingredients back in pot, then back on stove over medium heat. Add seasonings, tomatoes, and black beans. Reduce to a simmer and simmer for about 20 minutes. Serve the cooked chili topped with sour cream and shredded cheese if you desire. 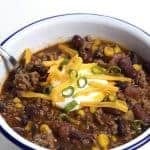 I love this chili with some tortilla chips or my Southern Buttermilk Cornbread on the side. Delicious! Here’s my recipe for Weeknight Black Bean Chili. It’s a keeper! 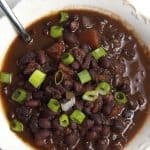 Black Bean Chili Recipe - Black Bean Chili is perfect for a quick-fix weeknight supper. Ready in 30 minutes, this chili is full of ground beef, black beans, and tons of flavor! Add diced bacon to a heavy-bottomed stockpot over medium heat. Cook until crispy, then add in onions and garlic and cook until tender. Add ground beef and cook until done. Drain off any excess drippings and place ingredients back into the stockpot over medium heat. Add seasonings, tomatoes and black beans. Reduce to a simmer and allow to simmer for about 20 minutes. Serve with sour cream and grated cheddar cheese, if desired. Really tasty chili that came together quickly. Thanks for the recipe! Hello. Can you please tell me the measurements for a serving? Thx. Great cold weather meal. 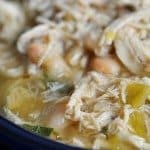 Chili tastes great and an easy fix. 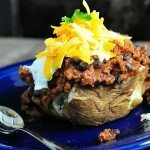 Your chili recipe is great and so easy to double. 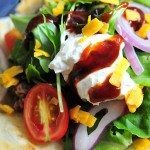 I use yogurt instead of sour cream.